SCVHistory.com HB5501a | Saugus | Saugus Cafe in TV's 'Highway Patrol' 1955. Saugus Cafe in TV's "Highway Patrol"
Screenshot from the TV crime drama "Highway Patrol" (1955-1959) starring Broderick Crawford as Chief Dan Mathews and William Boyett as Sgt. Ken Williams, narrated by Art Gilmore. This shot from 1955, Season 1, Episode 15: "Girl Bandit." This view is looking north up Bouquet Canyon Road, with the 1925 Saugus Cafe building at left. Wood's Garage is visible just past it at the corner. The 1952 Saugus Cafe building is out of frame to the left of it; both buildings are standing at the same time. The SPRR Saugus Depot is just out of frame to the right. 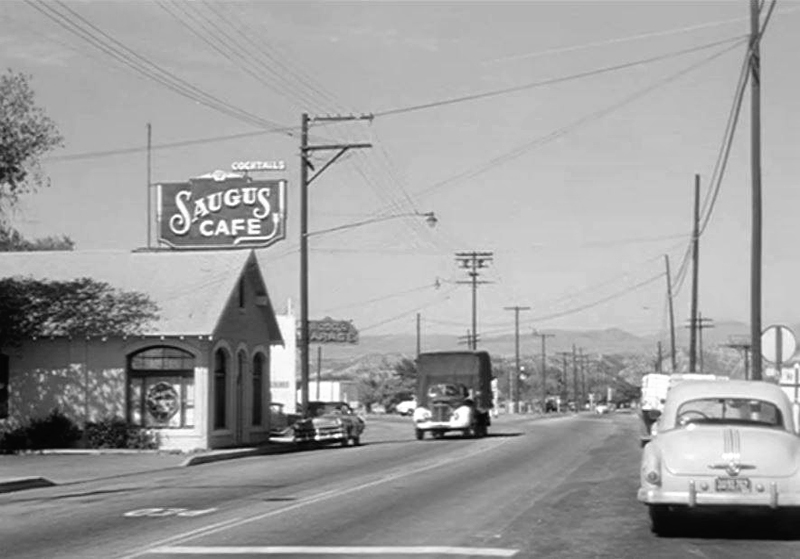 Image courtesy of Michael Phillips of Santa Ana, Calif.
About the Saugus Cafe building(s). The Saugus Café started life as Tolfree's Eating House inside the SPRR Saugus Depot, which was located at what is now the southeast corner of Railroad Avenue and Drayton Street. Structures on the 2.17-acre property as of 2014. Click image to enlarge. In 1905, then-owner Martin Wood moved the café across the street, erecting a brick structure at what is now 25865 Railroad Ave. In 1925, the brick building was replaced with a larger structure finished in plaster or stucco. In 1952, new owner Bill Rolls erected a new, 3,427-square-foot building, perpendicular to and set slightly back from the earlier structure. This is the current Saugus Café building at 25861 Railroad Ave. Both buildings stood together for a time. Apparently the 1925 structure was utilized as a cocktail lounge until it was torn down. 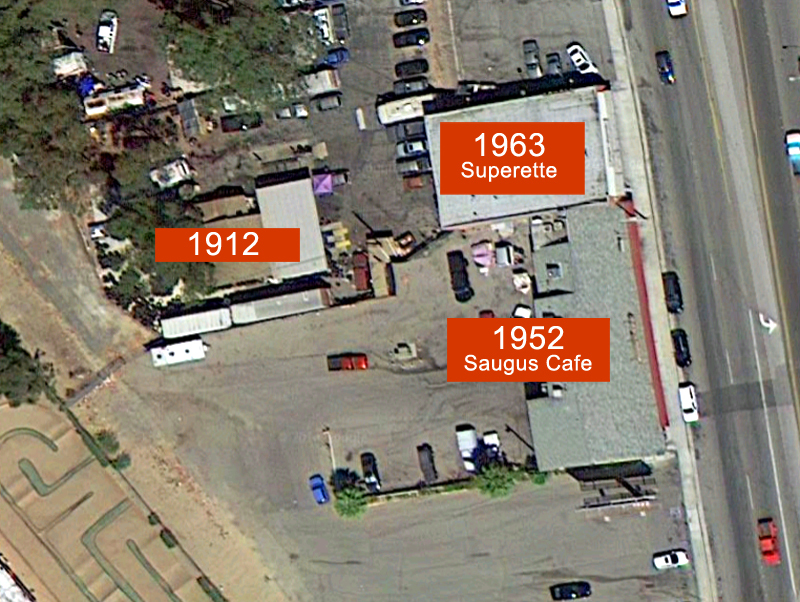 In 1963 the 3,500-square-foot Saugus Superette was erected in its place (again, 25865 Railroad Ave.), although this time, it was set back in an even line with the café. A 1,050-square-foot home built in 1912 also stands on the 2.17-acre property, behind the two larger buildings. The current (2014) propery owner is investor Hank Arklin, who purchased it July 10, 1996. Further reading: Tales of the Saugus Cafe. HB5501a: 19200 dpi jpeg from screenshot.